Light as a feather, yet valuable in hand-to-hand combat, this angelish devil of a cake is so gorgeous you’ll want to blow up a picture of it and stick it on your wall. The key to making this work is to whip, stir and blend as much air as possible into this baby. In the words of the great Devo, Whip it, whip it good. Crush up the cookies until they are crumbs. Use a food processor, or if you want to go old-school, but your cookies a bag and smash them into submission with a hammer. Stir in all the dry ingredients. Pour them into the pan and spread them out evenly. Pour in the melted butter and work it in the gingersnap crumbs until it’s evenly distributed. Carefully, painstakingly, build the crust along the bottom of the pan and then up the sides about 1 ½ inches. Careful not to make the crust too thick where the bottom meets the side of the pan. Blend together the eggs, lemon, vanilla and sugar. Then add small chunks of cream cheese until it’s all in. Once it’s a liquid, slip in the flour. Then I like to use a heavy-duty Mixmaster and crank that puppy up to 11. I stop every once in a while to give the machine a rest, and to crush up any big cream cheese chunks. No matter how much you mix this, there will be small chunks of cream cheese. Don’t worry, they’ll melt when you cook her. Seriously, ratchet up the Mixmaster for 15 minutes, maybe even more depending upon your mood. Then blend in the egg whites and the whipped cream, but use a plastic spatula. Not metal. I don’t know if that’s an urban legend, but that’s what I heard on, and I figure, Why risk it? Pour the batter into the pan. Put her on a cookie sheet just in case. 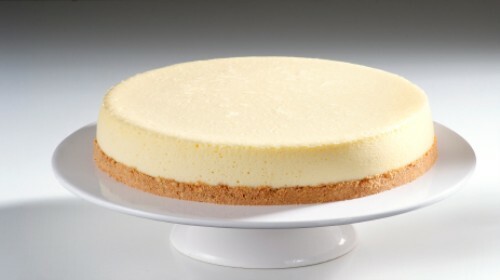 Then shove her in the oven as you say a prayer to the goddess of cheesecakes. Bake at 350 between 50 minutes and 1 hour. Stick a toothpick in her center to determine if she’s done. You want her to be a little bit wet, because you’re going to cook her for another five minutes at a very high temperature when you put the sour cream topping on her. And you definitely do not want to cook her too long. This is very very important. Because if you cook her too long she will be dry. And the pinup should never be dry. Moist. Light. Airy. Luscious. Stir all ingredients thoroughly. Wait until the cheesecake is practically down to room temperature. Apply topping evenly. Bake at 425 for 5 minutes. Let her cool off. Many places will tell you she needs to refrigerate for 12 hours. To me that seems extremist. Realistically four or five hours should work. Serve in thin slices. The Pin-Up is so rich you’ll wish she was a publicly traded company and you were the majority owner.